I’m fat. Fatter than I want to be. I’ve not always been fat, I got down to 180 at back in 2008. It took counting calories and weight religiously. The key piece for me was having a graph which I looked at daily showing my outcomes. Over the course of a year I lost 40 pounds. Well, it’s time to do it again. I’ve gained that 40 back over 10 years–and now it needs to go. Back in 2008 I was using Google to give me the calories of every item I ate and recording them in an Excel document. This food journal was great, but a little more work than it probably should have been. I signed up for MyFitnessPal. Counting calories worked once, I figure if it aint broke. But then I got to looking at how much work it would take to look at my improvement. I mean, I’d have to actually open the app on my phone and click on the weight loss section. Shesh–who designed that app? Two actions to get where I needed–ain’t no one got time for that. Enter hacker skills. I discovered there is a Python library which allows scraping of data. This wonderful little library is written and provided by CoddingtonBear. 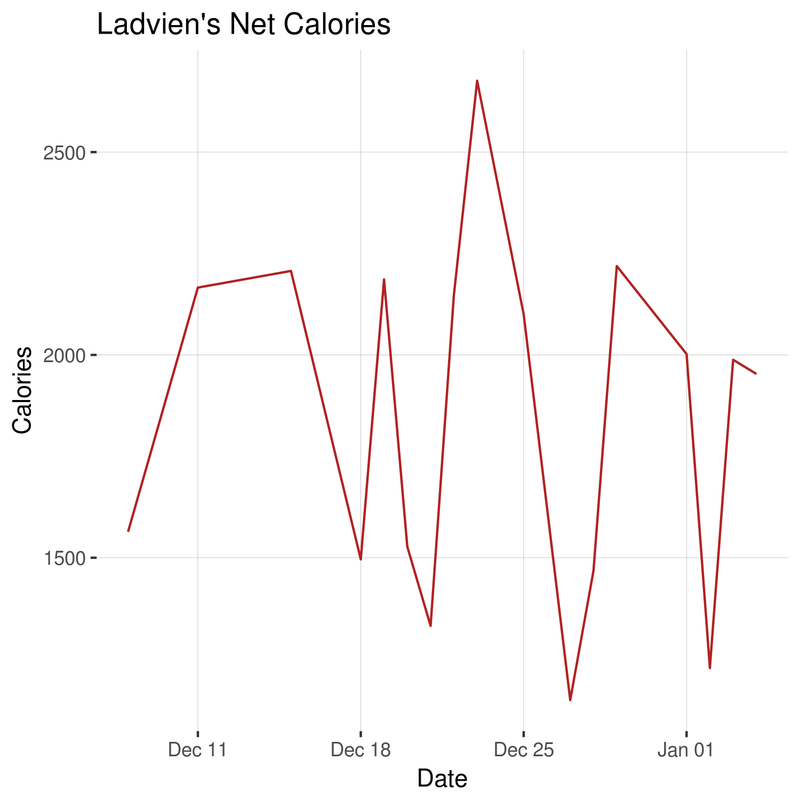 I figure, I’d write a Python script to scrap the data, save it to a CSV, create an SQL-R script to join the nutrition and weight information, use ggplot to plot the data, save the plot as a PNG, and then copy this plot to a dedicated spot on Ladvien.com. 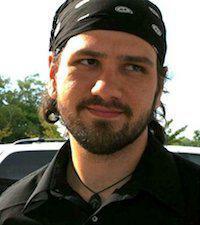 Lastly, I’d write a bash script to run every night and update the graph. Simples! And c’mon, opening a webpage is a lot easier than tapping twice. Well, after a few hours of coding, I’ve got the first step of the project complete. # Loop over years from beginingYear. Make sure last year is inclusive. # Open CSV as read and write. #   else, create file, write only. if(row_count != 366):               # A year of rows plus headers, and an empty line at end. f = open(thisFileName, "w+")        # If file does not exist, create it. # Check number of lines. If the year wasn't captured, start over. sys.stdout.write(str(yearIndex)+": ")   # Print has a linefeed. And then we add some R to join the data together and automate plotting, and saving the plots as images. 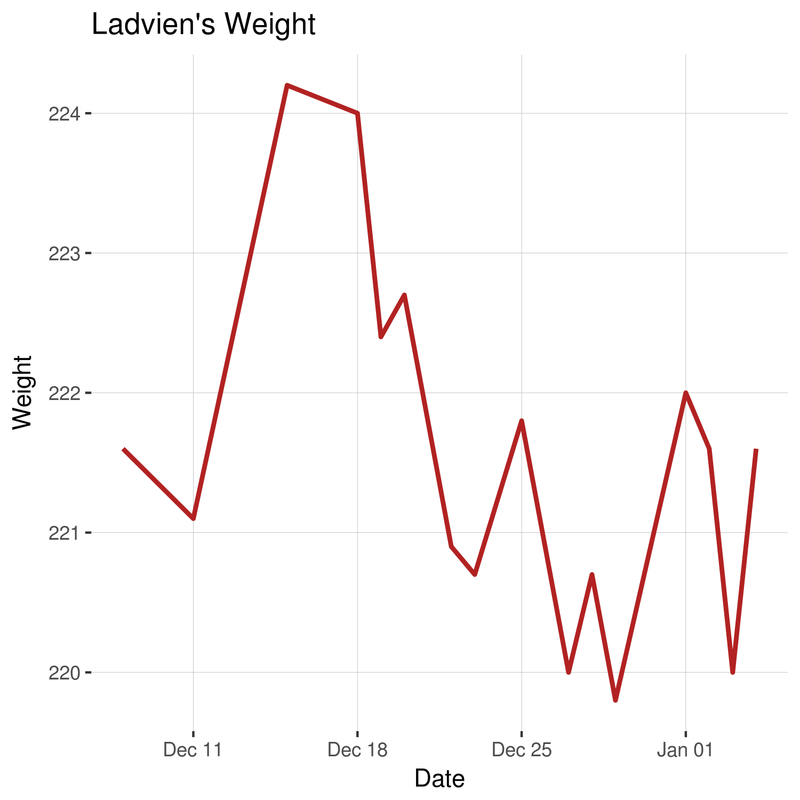 ECHO "* Syncing files to Ladvien.com                        *"
Next, I’ll probably tweak ggplot2 to make the graphs a little prettier. Also, I’ll setup a Raspberry Pi or something to run the bash script once a night. Why? Lolz.